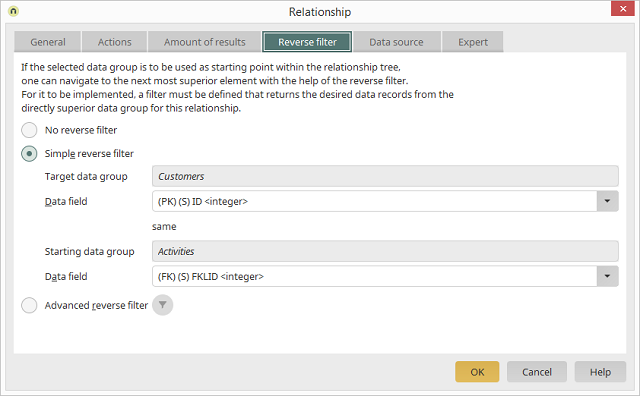 Reverse filters are used if you want to be able to navigate to superordinate Relationship elements in the browser. A reverse filter is disabled with this setting. Corresponds to the superordinate data group. The data group is entered here automatically if a reverse filter can be defined. A reverse filter cannot be defined for the starting point the highest level of a relationship diagram. Select the data field that contains a unique key that can be used to identify the dataset in the superordinate data group (e.g. the primary key). Corresponds to the data group of the currently selected Relationsip element. The data group is also entered here automatically when the reverse filter is activated. Select the data field where the unique key of the superordinate dataset is saved (e.g. the foreign key). Opens a dialog where the filter can be defined.